So it goes...: Mission Accomplished! Well, the 5K run for cancer was yesterday and we all made it through. I finished in 23:25, and Donna in about 38 min. It was an awesome event; a great day with the whole family and our friends Jill and Steve. It was not too bad of a run, though did get a bit warm near the end, especially in the sunny areas. There were 600+ runners and 2000+ walkers, so it was well attended. 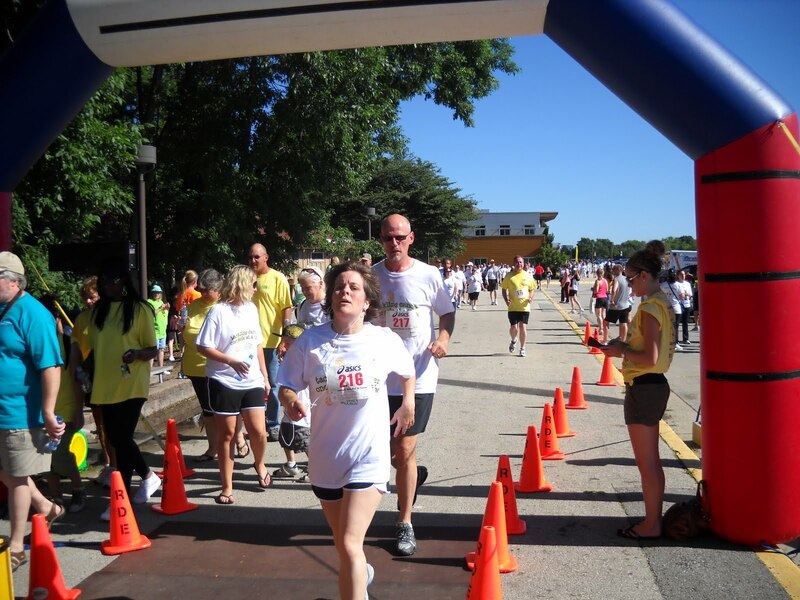 It actually is nice to have behind me, as it was a goal for the summer to run in and finish without walking a 5K. A simple goal to be sure, but one I'll take nonetheless. The run for me was especially meaningful in light of the news I received a couple of weeks ago that my brother has been diagnosed with a form of bone cancer called Chondrosarcoma. I really don't know much more about his condition than that. He's scheduled to visit the Mayo Clinic Tuesday and Wednesday to find out his diagnosis/treatment path. It's a bit like someone punched me in the gut. Just a rotten, sick feeling. I want to remain positive about it because we don't know much at this point. All I can do at this time is wait and pray, so that's what I'm doing. That's what my wife and kids and friends are doing. My friend Steve is going through a similar situation with his brother, who has pancreatic cancer at 42. Then my Mom tells me tonight that my sister is going in for a biopsy this week too. (Those of you who know me know I lost a sister at age 5 to a Wilmes tumor). Then, there's my Mom's issue and I found out this week my step-father's ex wife has a rare form of cancer too. It seems to be a trying time for the whole family. Cancer of any sort is an ugly disease and this run and the situations in my family of recent has raised my awareness to just how awful it can be. The plan is to possibly run in one or two more in the fall. Our friend Patty has said she wants to run in a run for the Oconomowoc Police in Oct. We'll see how it goes for all of us. I am taking the summer off from running because it gets so beastly hot. 3. Not finish until 2 days later, which is always embarrassing. Now a duathlon, Run 3.0, Bike 10, Run 2.0 is more along the lines of something I could do. So I'm giving it some serious thought. We'll see how the fall runs go and I'll talk more to some who've done duals and see what I'm up against. It was a great fathers day today. I am lucky to be blessed with two great kids and a wonderful woman! I got a Gander Mountain Gift Card which should come in handy with Canada being only 8 days away.